If you are a free spirit type homeschool mom (I am). We don’t much like the thought of a homeschool schedule or routine. That sounds boring right! Trust me I know. My inner spirit animal is something that parties all night and sleeps till noon. However my “spirit animal” took back seat to the mother bear that comes out when my kids lack a solid homeschool schedule and a rock star morning routine. Now I know, once I have crafted a perfect morning routine into our homeschool schedule we become so much more productive. And that is worth sidelining my party-all-night/ sleep-in-late spirit animal. a good day, which will turn into a good week, which will turn into a good year, which will turn into a good life! So clearly a good day is important, and how else do you start that than to have a good morning? Let me start off by saying there is no cookie cutter routine here. You, your homeschool, and your kids are all unique. Don’t fall into the trap of thinking you need to try to fit into someone else’s mold. Identify what is important to you and your unique situation. Do you have a variety of ages and you want them to work together? Are your kids in need of a little quiet time to start with to be more centered and focused? Do you have kids who dread a certain thing and using the “eat the frog” approach (doing the thing you dislike the most first because everything gets easier from there)? What sort of timetable are you looking at for your particular situation? Do you want to be done by noon? Do you need to work outside of the home while homeschooling? What are your homeschool goals? Do you have a very vigorous curriculum or do you take a more laid-back approach? Do your kids need reminders or a routine chart to follow? Or are they doing good with their own daily planners? 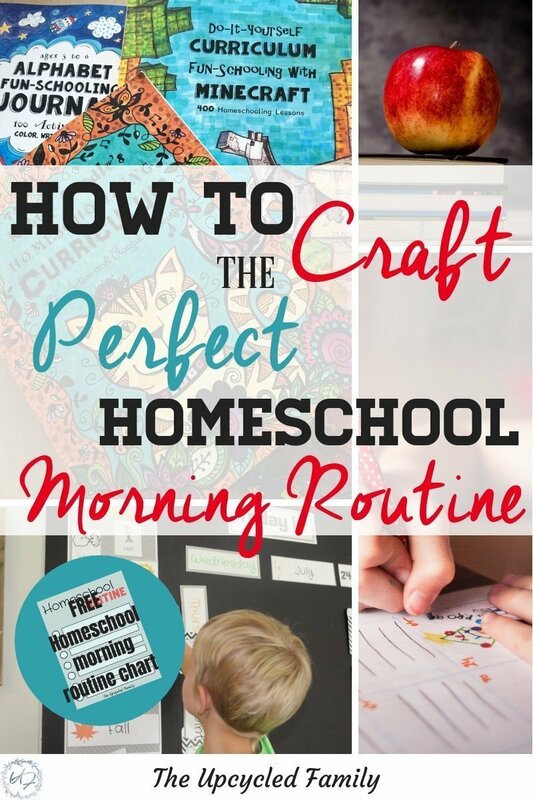 If you know you need a better homeschool schedule and morning routine, but not sure where to start let me share our morning routine that I have tweaked over the years for our homeschool. We are starting our 7th homeschool year and I have learned routines are an absolute must. If I start to notice that our mornings are getting chaotic and stress levels of everyone rising, I know then we have relaxed on the routine, then I reign it back in. Meditation: for us, this has been a game changer. We start our learning day right here and it improves everything by like 150% (seriously). Improved focus, less whining and irritation when dealing with others, Quicker memory recall and so much more! Move on to the rest of our curriculum: About this time its nap time for the littles, and the three older kids break off into stations I have scheduled for them. I spend anywhere from 15-40 minutes with each kid walking through language arts. While the others are doing something like online math or foreign language. By the time everyone has rotated through being with me, they have also rotated through math and foreign language lessons, and personal reading time. It is then time to start getting lunch ready and wake the toddlers up. P.S. Looking for more homeschooling awesomeness? Subscribe to our newsletter and join the Upcycled Family community for more homeschooling, healthy, family, recipes, freebies and more!